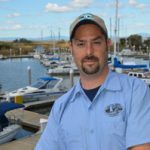 Marina Leadworker & Property Manager James Pflueger is an experienced maritime business professional. As a Coast Guard veteran, Cal Maritime graduate, and holder of a USCG Unlimited tonnage license; he personally invites you to experience the charm at the best location on the Delta. The professionalism and unwavering dedication to excellent customer service is what makes the staff at Antioch Municipal Marina exceptional, we care that your experience with us is positive and enjoyable. From providing professional boating information to better servicing your needs as a customer, our well trained marina staff is dedicated to your personal satisfaction with a smile 7 days a week. Come see the difference, where customer service comes first! If you have a boat and you would like more information please schedule a tour by contacting us by email or by calling (925)779-6957. What are your rates for a berth and what does that include? Our fiercely competitive rates for berthing are $5.75 per foot uncovered berths and $7.25 per foot covered berths. Minimum size berth uncovered is 24’ feet, covered is 32’ feet. We charge by the berth size or the vessel’s length whichever is greater. Berth rental includes water, electricity is metered. 20 and 30 amp service is available. Computer controlled access gates and on-site Marina Office open 7 Days a week. Access to exclusive Berther restrooms and showers. Coin operated laundry facility on site. Chevron Marina Fuel Dock dispensing diesel, Mid-grade gasoline, and oil products at competitive prices. Do you have a Boat Launch Ramp? Yes, The Antioch Marina has a boat launch ramp. The charge is $5 per launch for vehicles with trailers (all vehicles with a trailer must have a valid launch permit). There is a self pay station on-site. Each launch permit is valid for 24 hours. You may purchase up to 3 permits totaling 72 hours max. Annual passes are also available for purchase in the Marina Office for $100 (valid from January to December). Small non-motorized vessels such as kayaks do not require a launch fee unless you have a vehicle with trailer. Parking lot space is ample and well lit.